Lincoln Portrait. by J. C. Spooner. Albumen print in original frame. The print is 12 ¾ by 10. The text, “Photo. by J. C. Spooner. 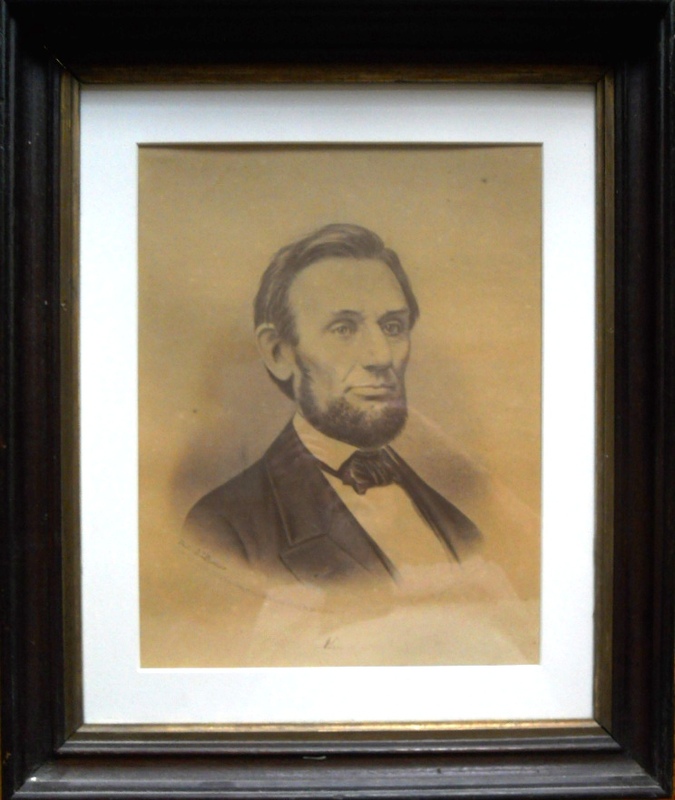 Copyrighted according to Act of Congress in the year 1865 by J. C. Spooner in the Clerical Office of the Massachusetts Court…” is part of the photographic image, as is a holographic signature of Lincoln. There is a 15 cent tax stamp attached to the verso of the mount, indicating the original cost of the image was approximately between $2.00 and $3.00 and sold before August 1866. The print was conserved and re-housed by the Conservation lab at the George Eastman House in the mid-1990s. C. J. Spooner was listed in one Boston Guide or Commercial Almanac of the era as “…a photographer and an artist…” working in Roxbury, Mass, during the mid 1860s. Spooner either bought a photographic portrait of Lincoln by Alexander Gardner, then bleached it and redrew over the image, or possibly he bought a carte-de-visite by Gardner and then projected the image to size, and drew over that. (A fellow Boston photographer, Albert Sands Southworth, had pioneered projecting portraits to a new size and recopying them during the daguerreian era; and its possible Spooner was familiar with that process.) Then in order to market and distribute his work, Spooner photographed his drawing and sold photographic copies to whomever wished to purchase the portrait. Spooner then copyrighted the photograph of his drawing in the local Massachusetts court as an original work of art. (The copyright issue was still very new at that time and Spooner probably chose the Massachusetts court for both convenience and for protection against any possible claims of plagiarism that any New York or Washington photographers (Brady or Gardner) would have filed in a different district court. All of these practices were known and even common during this period — so this would have been considered as a clever act rather than than a criminal one.